If you'd like to be notified when we publish updates on the official CIT blog, submit your email address below and approve the confirmation request that is sent. Last month, Pacifica Radio hosted a series of debates about 9/11, which were then broadcast nationwide on their radio network and affiliates as part of their 9/11 tenth anniversary special. In the debate about "the lingering questions surrounding the attack" at the Pentagon, I had a chance to go head to head with Anthony Summers, co-author of the book The Eleventh Day: The Full Story of 9/11 and Osama Bin Laden. He argued in favor of the official narrative, while I (of course) argued against it. On the tenth anniversary of 9/11, American researchers will appear live at The Royal cinema in Toronto to present exclusive interviews with eyewitnesses to the act of mass murder which took place at the Pentagon that day. Their documentary film, which has been translated into several languages and garnered more than 500,000 views online, makes the case that these detailed audio and video-recorded witness accounts prove "beyond a reasonable doubt that the violent event at the Pentagon was the result of a carefully planned and skillfully executed military deception," not a surprise attack by kamikaze hijacker pilots as alleged. The film, National Security Alert, will be incorporated into a multimedia presentation along with other relevant evidence. The event is being sponsored and hosted by Toronto-based author and TV producer Barrie Zwicker. Doors open at 7:30pm, and the event begins at 8:00. Will Call tickets can be purchased in advance for $10 at CitizenInvestigationTeam.com. At the door, tickets will be $15 (regular), $12 for students and seniors; or pay what you can. We've been put in the difficult position of having to defend ourselves against people whose work regarding the destruction of the World Trade Center we respect and appreciate. Although we had never spoken to David Chandler or Jonathan Cole prior to the publication of their joint statement on the Pentagon attack, we had always considered them natural allies, had never badmouthed them or had any inclination to do so, and had even praised their work. Unfortunately they did not have the courtesy or sense to get in touch with us to see if we had any responses to their apparent serious issues with our work before publicly denouncing it. The result, as we have now documented in great detail, was a simplistic, horribly sloppy, and defamatory essay which reveals that, at best, they had barely spent any time at all on our website, let alone bothered to view our extensive catalog of video presentations to familiarize themselves with the full scope -- or even many of the basics -- of the evidence we present, or us personally, before rushing to judgment and aggressively attacking us. Captain Ross "Rusty" Aimer and engineer Stanley Beattie have decided to join the ever-growing list of experts, scholars, journalists, activists, researchers and concerned citizens who have formally offered praise and support for our presentation National Security Alert. Dwain Deets is an outspoken 9/11 truth advocate who is a core member of both Architects & Engineers for 9/11 Truth as well as Pilots for 9/11 Truth. He has recently launched a website regarding the destruction of World Trade Center building 7 at 7problemswithbuilding7.info. "It's no exaggeration to state that the findings of the Citizen Investigation Team (CIT) concerning what really happened at the Pentagon on 9/11 are reliable, undeniable, conclusive and of immense historic significance. The evidence now shows, well past reasonable doubt, what happened. 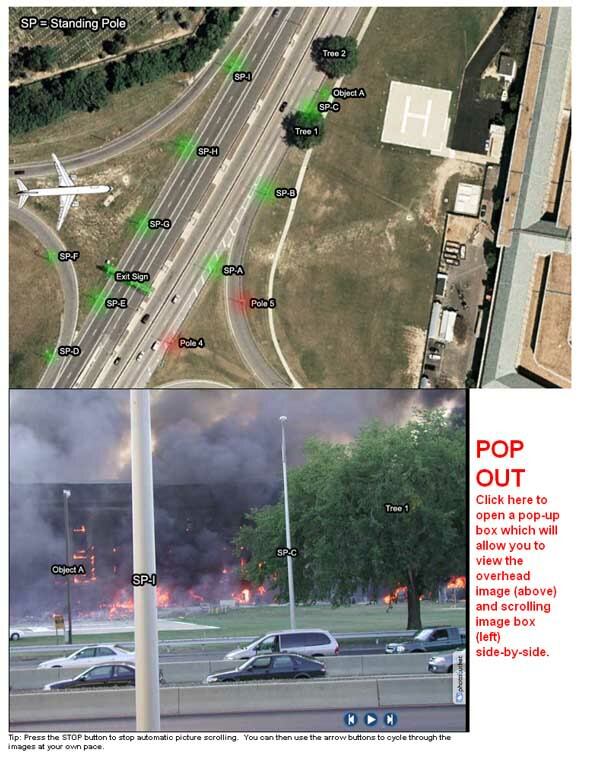 It was detonation of explosives within the building, timed to coincide with a flyover by a large jet plane, thus producing the clever illusion that flight 77 crashed into the Pentagon, heart of the official 9/11 Pentagon lie. Primary credit for dispelling this illusion must go to CIT. Team members, with only truth-seeking as their motive and with few resources, succeeded in finding 13 eye witnesses whom they interviewed fairly and transparently. The heavy convergence of honest reports by these eye witnesses, and other compelling evidence, can be seen in CIT's highly revealing DVD "National Security Alert." The evidence fails entirely to support the official story's alleged flight path of alleged flight 77. The evidence does, on the all-important other hand, support a flyover flight path. SAN JUAN CAPISTRANO — A three year independent investigation into the September 11, 2001 attack on the Pentagon has yielded new eyewitness evidence which, according to the Southern California-based researchers who conducted the investigation, "conclusively (and unfortunately) establishes as a historical fact that the violence which took place in Arlington that day was not the result of a surprise attack by suicide hijackers, but rather a military black operation involving a carefully planned and skillfully executed deception."